The deadlock for San Pietro, key to the Liri Valley, was broken by a coordinated Divisional attack. From three sides Division troops, after securing Mt. Maggiore and Mt. Sammucro, were closing in. As the attack opened at midday of December 15, the 2nd and 3rd Battalions, 143rd, continued to hammer in through the olive groves and terraces on Sammucro's slopes. Sixteen tanks of Company A, 753rd, moved down the narrow winding road from Venafro with the mission of breaking into San Pietro. The 141st Infantry struck frontally over the open flatland of the valley. The 142nd waited under cover on Maggiore's side ready to move on Mt. Lungo after dark. THE GERMAN WINTER LINE stretched across Mignano Gap, with key defenses on Mt. Camino-Maggiore, Mt. Lungo, San Pietro and Mt. Sammucro. 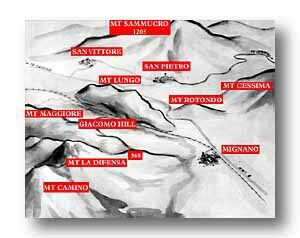 Each of the mountain fastnesses had to be painfully reduced before San Pietro fell. Then the Germans dropped back to the line of the Rapido and Cassino. Click on the map to view a larger image. 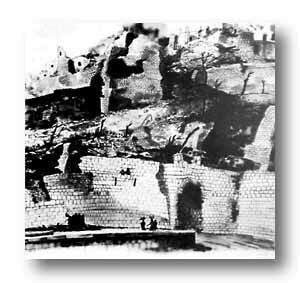 All fifth Army artillery within range was directed against San Pietro and the surrounding area. The 141st advanced 400 yards until halted under the weight of fierce enemy fire. For a third time 2nd and 3rd Battalions, 143rd, were stopped after gaining 100 yards. Of the tanks, three reached the outskirts of the town, two of these were destroyed and one was missing. Five others were lost behind enemy lines. Five hit enemy mines. Only four returned. 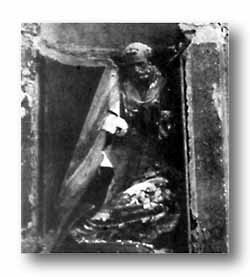 SAN PIETRO'S patron saint, having withstood the seige, looks sadly upon war's ruin. After dark Companies E and L, 143rd, finally succeeded in penetrating enemy positions before San Pietro, but were forced to retire. On Mt. Lungo, however, the Germans were surprised and routed by the night attack of the 142nd. When this kingpin fell the Germans throughout the San Pietro area made preparations to withdraw. He counterattacked to cover his withdrawal. Our own artillery in defense was brought to within 100 yards of the front lines. When, after five hours, indications of the enemy intent were clear, patrols went out to make contact. San Pietro was ours for the taking. The 2nd and 3rd Battalions, 143rd, less than a rifle company in strength, trudged past San Pietro to consolidate gains, and re-establish contact with the enemy, taking up positions five kilometers beyond. After the battle, the 143rd alone required 1100 replacements. On Christmas Eve the men of Lt. Col. J. Trimble Brown's 1st Battalion, 141st Infantry, attacked westward from the top of Sammucro, together with men of the Special Service Force, to clear the western slopes. FRANK DUNCAN'S DRAWING OF SHELL-TORN SAN PIETRO SHOWS ARMY MEDICAL AID STATION AND CIVILIAN WASH.